How mud tank works, it is a very easy question, but it contains some good questions behind, so we get all these resolved. First we should know the feature of mud tanks, than the components, how it works in the solids control system, what the main fuction is, last but not least how to clean the mud tank. A mud tank is an open-top container, typically made of steel, to store drilling fluid on a drilling rig. They are also called mud pits, because they used to be nothing more than pits dug out of the earth. The mud tank is devided into Square tank and Cone-shaped tank according to the shape of tank bottom. The body of the tank is made of welding the steel plate and section, using the flat cone-shape structure or the corrugated structure. The mud tank surface and the passage are made of the slipping resistant steel plate and linearity netted steel plate which is produced by the professional factory, the mud tanks are made of the side steel pipe, all of the structure can be folded without barrier and pegged reliably. The surface of tank is equipped with water pipeline for cleaning the surface and equipment on the mud tank, we use soaked zinc processing for the netted steel plate. The ladder is made of the channel steel to take responsibility the body, the foot board is made of the linearity netted steel plate. The two-sided guard rail are installed the safe suspension hook. The mud tank is designed the standard shanty to prevent the sand and the rain. The pipeline is installed in the tank to preserve the warm air heat. Mud tanks are the base of solids control equipments.Mud Tanks for solids control system is divided into Square tank and Cone-shaped tank according to the shape of tank bottom. The body of the tank is made of welding the steel plate and section, using the flat cone-shape structure or the corrugated structure. The mud tank surface and the passage are made of the slipping resistant steel plate and linearity netted steel plate.The mud tanks are made of the side steel pipe, all of the structure can be folded without barrier and pegged reliably. The surface of tank is equipped with water pipeline for cleaning the surface and equipment on the mud tank, it uses soaked zinc processing for the netted steel plate. The ladder is made of the channel steel to take responsibility the body, the foot board is made of the linearity netted steel plate. The two-sided guard rail are installed the safe suspension hook. The mud tank is designed the standard shanty to prevent the sand and the rain. The pipeline is installed in the tank to preserve the warm air heat. The main fuction of mud tank is storege, because the worked drilling fluids must stored to the next seperation or to the next recyclation, or to be reused. A tank is sectioned off into compartments. 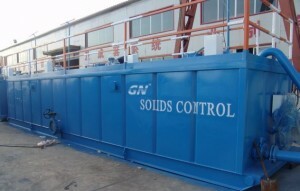 A compartment may include a settling tank, sometimes called a sand trap, to allow sand and other solids in the drilling fluid to precipitate before it flows into the next compartment. Other compartments may have agitators, which are large fan blades stirring the fluid to prevent its contents from precipitating. Then the mud tank works, as you can see, store the drilling mud, and do whatever he should do in the solids control system. Then you also should take care of him. Mud tanks are used by oil drilling companies as storage for drilling byproducts called mud. The mud tanks do need to be cleaned and they require specialized equipment to do so. Many companies have the equipment and expertise to clean mud tanks efficiently and at a cost-effective rate for your business. There are a few ways to approach this task for you business.